When you are asked to review a product like The Phonics Road to Spelling and Reading, a program that is extremely thorough, well-laid out and chocked full of great information and provides video training for the teachers ~ it can seem a just a bit overwhelming. Because a 'quick' review really won't do this program justice. And if I were to highlight every aspect of this amazing curriculum...well, you might be reading here for awhile. I was sent the Level 1 package of a four year complete phonics program for K-4, designed to build skills in spelling, reading, writing, grammar and composition. Phonics Road goes hand-in-hand with another product offered by Schola Publications called The Latin Road to English Grammar. The theme of Phonics Road is building: the apprentice (student) and foreman (teacher) learn and build on skills, developing strong reading, spelling and writing skills. Rather than focusing whole-word method to teach reading, your child begins learning the basis to good reading and writing with spelling being the key to it all. "The Apprentice begins by learning the tools of his trade - single vowels and consonants, vowel teams and consonant teams. After these tools are mastered, the Apprentice uses them to build words according to the Blueprints (spelling list). Along the way the Foreman shows that words are formed according to Building Codes (spelling rules). Rules are set to songs - Rule Tunes - for easy memorization." The program is laid out with every bit of information you need to effectively teach your child and includes 10 DVDs that provide step-by-step instruction on what to teach and how to teach it. There are over 16 hours of teaching examples for you as the "foreman": especially how to correctly speak, write and read the sounds that are introduced in this level. As your child progresses through the Phonics Road, they earn 'tools' (sound & letter cards) for their 'toolbox'. About 15 weeks into the program, they begin reading and illustrating short stories using story booklets. The story booklets have room for your child to illustrate at the top of the page what they have written about below. Apprentice's Building Manual ~ includes Blueprints (all paperwork for the year), Building Codes (blank charts to fill in), Composition pages, First Readers (23 ready to illustrate), Handy-dandy Clipboard, Student Tool Cards and Pens & Pencils. Overall, Phonics Road is an amazing program and would be a great investment in your homeschooling curricula. The price, $199 for the complete first year kit, is a bit high, but the bulk of the material is not consumable and can be used year after year with other children. Additional student/apprentice kits can be purchased for $69. 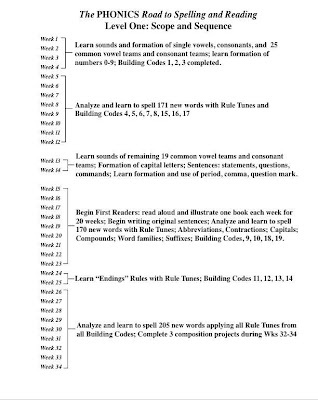 The Phonics Road to Spelling and Reading will require time and effort on your part. To effectively and properly use the program, time needs to be spent watching the instructional DVDs, but the end results of the program will far outweigh the time input that is initially needed. If you are one that is intimidated by teaching phonics because you don't have the first clue where to begin, this would be an excellent program for you because it walks you through each lesson step-by-step so that there are no questions left unanswered. The Schola Publications site offers some free audio workshops as well as a sample DVD of their program. You can also view their intro video online and request more information about their curriculum. Be sure to check out the Homeschool Crew blog to see reviews on the different levels of both the Phonics Road and the Latin Road.